Often referred to as the Browning Pistol, the M1911, remains one of the most popular guns in military, law enforcement, and competition shooting arenas. The single-action, semi-automatic handgun, designed by John Browning, is best known for being a basic weapon that allows the user to customize almost every aspect of the gun. Due to its popularity, the pistol was copied by many manufacturers and became a preeminent weapon throughout the 20th century. It was used as standard issue in the U.S. military from 1911 to 1986 when it was replaced by the 9mm Beretta. The M1911 remains popular with civilian competition shooters, due in part to the ability to customize the handgun. Users may use grips, replacement sights, and aftermarket accessories to personalize the piece or change the triggers, hammers, and sears. Various compact, target and tactical models are available. 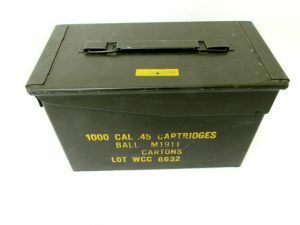 Our Top Pick for Best Online Ammo store is Ammo.com. This site offers the best ammo prices on an easy to use site. Customers rave about their customer service and fast shipping as well as their dedication to Second Amendment rights. Ammo Man – Launched in 1998, Ammo Man is a New Hampshire-based e-commerce company that specializes in ammunition. Ammo Man has a vast catalog featuring ammo for handguns and rifles. Shipping is free on orders over $99. AmmoSeek – Lots of people rave about the search engine at AmmoSeek. Search the inventory of online sites for ammunition, magazines, guns, and reloading components. Ammo to Go – This online seller has gone from garage to super power when it comes to selling ammo. A fully stocked warehouse gives this Texas-based company the ability to offer hundreds of items to its customers. Competitive pricing and quick turn around times make Ammo to Go a contender in the marketplace. Ammunition Depot – Like Ammo.com, Ammunition Depot fully supports Second Amendment rights. The family-owned retailer carries a wide variety of ammunition, magazines, cases, and gear. They take pride in offering high quality goods backed by outstanding customer service. Bone Frog Gun Club – An expert and former Frogman developed this site devoted to supplying customers with the best in ammunition. The company only sells new, American-made items and gear. Brownells – Outstanding reputation as a source for ammo and supplies and offers 100% guarantee. The Iowa-based site is often referred to as a go-to place for ammo and anything related to firearms. Buds Gun Shop– Listed as a reputable site by customers. Large selection and exceptional service allows it to compete with much bigger outlets. Bulk Ammo – If you’re looking to buy in bulk, Bulk ammo is the best want to order large quantities of ammo, Bulk Ammo is the place to go. Buying in bulk means getting great ammo prices. Check out their weekly sales. Cheaper than Dirt – A lot of what CTD sells is ammunition. Customers can order by the box or in bulk. The site also carries a lot of accessories and parts for firearms. As the name says, they strive to provide products as inexpensively as possible. Lucky Gunner – Lucky Gunner ranks at the top of many shooting enthusiasts’ lists. They have an excellent price estimator for shipping. SGAmmo – Their website needs an update, but SGAmmo still gets points for products and services. A family-owned and operated business, SGAmmo has a massive selection of ammo, with low prices. Sportsmans Guide – SG is a good choice to when you want to buy ammo online. Customers can order top brands in single boxes or in bulk. They have a huge selection of ammo for handguns, shotguns, and rifles with brand names such as Federal, Remington, and Hornady. Not all sites quote accurate shipping prices. Even if the site promises the best prices, your steal of a deal can turn into an expensive venture. Does the store show which items are in stock? A store may offer excellent deals but if they don’t have the items in stock it can become an exercise in frustration. Buying ammunition online is relatively easy but can cause big problems if you violate local, state or federal laws. You may not receive your order and/or end up paying shipping or restocking costs.